GREAT WHITE has got to be one of the most tenacious and persevering bands in music history. They have faced adversity from breakups, litigation and tragedies beyond comprehension. Despite the tragic Rhode Island nightclub fire, where 100 people lost their lives, the band remains strong. 2015 marks 32 years together for GREAT WHITE. It’s hard for most people to maintain any relationship for that long, let alone a band that has faced such tribulations. 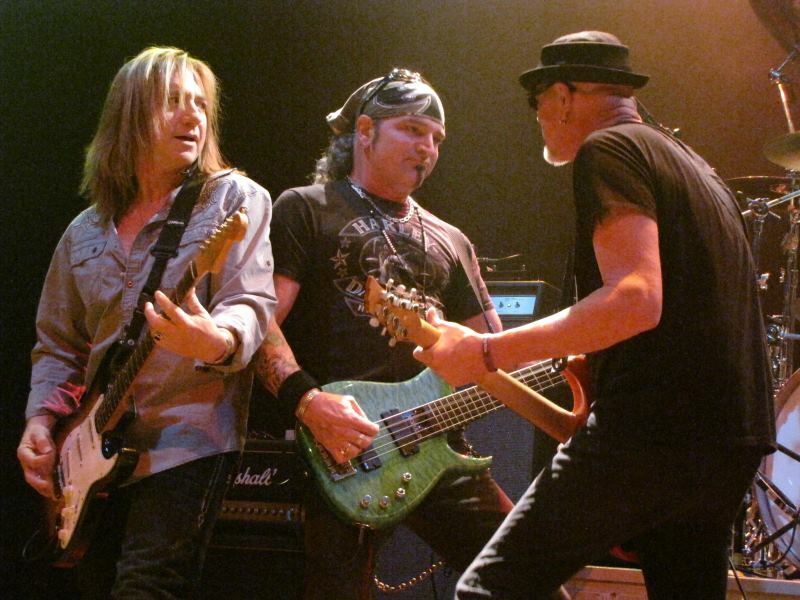 Over the past several years, GREAT WHITE has continued to perform with a divergence of lineups, the most tenuous being the dissolution of original singer Jack Russell that resulted in a contentious court battle over the band's name. The latest lineup appears to be the strongest to date, with founding lead guitarist Mark Kendall, singer Terry Ilous, guitarist/keyboardist Michael Lardie, bassist Scott Snyder and drummer Audie Desbrow. Having been refocused, in 2012 the current lineup released two albums, Elation and a celebration of their 30-year anniversary titled 30 Years - Live From The Sunset Strip. The band is presently touring and looking forward to recording new music and performing. They will be touring quite a bit this summer, with a big show hitting The Joint at the Hard Rock in Las Vegas, Saturday May 30th featuring GREAT WHITE, TWISTED SISTER, EXTREME and SKID ROW. 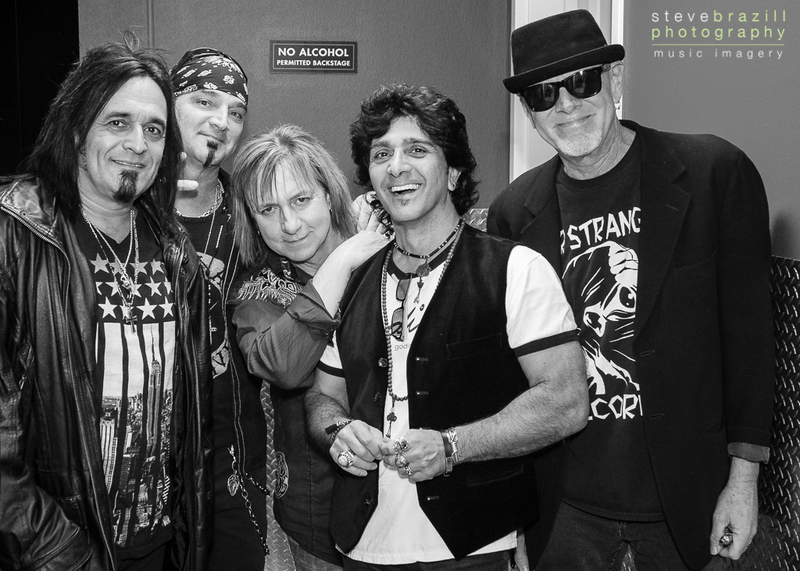 It’s an early show with doors at 5pm, and GREAT WHITE taking the stage at 5:30pm. Get there early! I recently talked to my friend Michael Lardie about the band and all things GREAT WHITE. Michael remains one of the nicest and hardest working guys in the music industry. KNAC.COM: You know what the nicest thing about doing phone interviews is? You get to sit on the phone in your pajamas. KNAC.COM: Haha! No. We are definitely not facetiming. So, I’m pretty blown away that GREAT WHITE has been together for nearly 32 years! LARDIE: Yeah, the band actually started with Mark in 1979 or ‘80. He had a band, and that band split apart during a time that our former singer went off to incarcerationville (Russell was arrested for shooting a live-in maid in a botched robbery attempt and sentenced to 8 years in prison). So Mark basically had to start from scratch. Mark handpicked some players which eventually became DANTE FOX, and when Jack was out (he only served 18-months of his prison term), he was back in that band. When Alan Niven started to manage them in 1982, he said he liked what the band was about, but that the name had to go. So the band was worried at the time that they would lose all their following, all 75-people [laughs]. Mark tells me that Alan came up with the name GREAT WHITE because that was Mark Kendall’s nickname. He had very white hair - when he had hair [laughs] and very light complexion. They called him The Great White. So they figured out all the marketing that could go along with the image of GREAT WHITE, and it made sense with a heavier rock band. When I met the band and they recorded their first record for EMI in 1983, at that point they were a four piece, and they went out on tour with JUDAS PRIEST on the Defenders Of The Faith tour and they came back to record the album Shot In The Dark, they decided that they wanted to try out some keyboards on the songs and I just started working with them from there on. The first record (Stick It) I actually played some backgrounds on and did some engineering. I did some work on Shot In The Dark and started playing with them in January of 1985 and that was the first show both Audie and I had begun with GREAT WHITE. 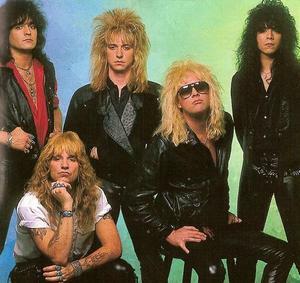 KNAC.COM: The band has been through a lot more stresses and strains and a few personnel changes and somehow have managed to keep it together through the years. How do you guys manage that? LARDIE: It’s funny, we were having this discussion the other day, of how this band has stayed together for 30-plus years, and one thing we haven’t demanded upon ourselves is to require ourselves to be social together in our down time. It’s kind of like having a great friend or someone you see only partially throughout the year, and it’s always fresh and fun that way, and we allow each other to have personal lives outside of the band. I think, for ourselves anyway, that the big key to the longevity of the band is that when we are together, we have such a blast doing it and it’s enjoyable and it never gets into the place of being arduous of not being around somebody for too many hours, or too many days, or months. I think obviously the love of making music together and that sound that happens when it’s this group of people that does that. KNAC.COM: I think THE BEATLES were only together for about 7-years. That’s pretty incredible to think about and the potential of what their discography would have looked like 30-years later. KNAC.COM: It’s incredible. 30-years is a long time to stay with not only someone you really like and are in a relationship with, but any one person, let alone a group of five. Speaking of personnel changes, the obvious not so great white elephant in the room is screaming out to be addressed. I know you guys in GREAT WHITE have kept a really zen approach with the situation with Jack (Russell), but can you tell us a little about what’s going on with that? LARDIE: There’s really not much to tell. In March of 2012, he had sued us for the name and we countersued for the name. Our original court documents were such that the majority of original members, or corporate members that own the name. Never could one person go out and say they were the name. Obviously it’s the majority with Mark, myself and Audie. It was decided in court and we decided on the concept that we’re called GREAT WHITE and Jack can call himself JACK RUSSELL'S GREAT WHITE. I would never want to block his ability to go out and make a living. I think it was the right call that the majority of the core of the band are moving forward with being in possession of the name. KNAC.COM: Jack was pretty straightforward to me in saying some pretty unkind things about you guys. He said he tried to reach out to Mark, and that Mark made a big mistake by not contacting him as he had some kind of promising proposal for him. It was really quite awkward honestly, and I have to be honest, it was sad seeing him in the state he was in. How are you guys countering this from his camp? In addition, I think it’s really uncomfortable for the fans that have to deal with that kind of split up of band members. I liken it to the QUEENSRYCHE thing that happened and how the fans were basically in a situation where they had to pick sides. It gets pretty ugly sometimes. How do you handle that kind of adversity if you run into that with fans? LARDIE: It’s always funny to me, the people that actually played on the record, or that wrote the songs primarily, between Mark and myself and Alan Niven, and Jack did have some contribution over the years, and I’m not denying that was the case, but reality is, we did the record Elation, and to me, even with the new vocalist (Terry Ilous), it still sounds very much like GREAT WHITE. I hope an indication to the fans as well. How we deal with that camp and this camp, respectfully I would just say that when we’re playing state fairs and festivals and casinos and people are coming out and we’re still selling out rooms, that’s pretty much how we do it. KNAC.COM: I just recently saw both renditions, and I honestly have to say it was pretty sad to see Jack’s version up against yours. His unfortunately was a pretty pathetic attempt that would have been lucky to land a gig at a dive bar with maybe ten people, whereas yours was completely polished and pro. It was just like night and day. How are you guys feeling? I mean, is there a sense of sadness there? LARDIE: It’s difficult to know what he was capable of and did do years ago. What a great performer he was. What a great vocalist he was. So that part of it is difficult for me to see from the outside in, but I really don’t make any judgment on it, I say it loudly and clearly, he has the right as someone who was involved with that material to go out and make a living at it. It’s just up to the fan as to what they enjoy. When he’s not having a good night, I don’t think anybody is having a good night. I mean, if I’m not having a good night I’m not representing the best I can be to pay homage to the music we created. That’s true of any performer when they’re not consistently hitting their best to the music. When there comes a time when I personally feel I’m not giving the best performance I can personally give, and I’m not really cutting it, I’m going to know that it’s time to step aside and let the legacy be a legacy. KNAC.COM: Did you see the performance of Scott Weiland? LARDIE: I did see a little of it on YouTube, but not much past a minute-and-a-half that pretty much was very clear it was not the best he’s ever done. KNAC.COM: I guess to me, I can understand being oblivious to really wanting to go out and continue. Maybe being in such denial that you think you still have it. I mean, it’s your baby. It’s what you’re known for, this has been your career...but I’ve got to say, looking at the players that were with Scott Weiland, and looking at the players that were up there with Jack the night I saw him, I almost feel more disdain for them, for allowing these guys to obviously get up and not be able to perform almost using them for a bite out of a small piece of fame. I actually think I feel really sorry for the performer who’s up there completely oblivious. I feel like someone should be nudging Jack, and saying, “Dude, I gotta be honest with you here bro”, and have him realize either he needs to step back and up his performance, or realize that gracefully getting out of it would be the best thing to do. LARDIE: It’s difficult I think for anybody, especially the sideman player that becomes involved with a lead singer from history, there is kind of that special magic for those people who certainly never had the opportunity to stand in the circle of the sun back in the day. It’s the closest brush with being connected to that thing whether it’s a Scott Weiland, or whoever. At that point, I don’t know if they’re ever going to be honest with themselves and say how they really feel about what’s going on because they’ve got a good gig, or what they believe to be a good gig. Musicians want to work, and that’s the reality. It’s not up to me to say whether they’re good or bad people about what they’re doing or how they’re feeling, I’m just blessed that it’s not me and it’s not us and we’re going out and doing the numbers that we’re doing, and doing the shows that we’re doing, and working with new material that has energy and vitality, and we’re going to just keep moving forward as long as it makes sense to keep doing this. I think collectively as a group we’ll certainly be honest with one another to the point that we’ll know when it’s time to call it a day. Right now it certainly doesn’t feel like it is. KNAC.COM: When did you guys decide that it was enough for you with Jack? I know he was missing some gigs and a few other issues because of his health and other issues. Was it a tough decision? When do you just say, enough, and let’s move forward? LARDIE: I don’t know if it was a switch that was flipped. I think it was many, many years, and many things that happened over time that wouldn’t be right of me to air any of that in public. It was an amalgam of things that lasted over 25 to 30 years that as a group of people between myself, Mark and Audie that we basically all looked at each other and said, “It’s time”. I don’t know if it’s one of those things that you flip a switch and it’s horrible and sad. It’s always horrible and sad when someone you worked with and created things with goes in the direction that they go in that is counterproductive to what you’re doing and counterproductive for the best things that they can be. When it goes in that direction, you never, ever like to see that. We’re all adults that we’re talking about even though we’re in a business where they encourage arrested development. It’s really about performance. When someone is on your team or at your work that isn’t fulfilling in such a way that isn’t being productive to the sum total of everything, then you make considerations as to where you want to go and how you want to proceed forward. KNAC.COM: On a more positive note, I liken Terry to a ninja Erik Estrada. He’s so fun to watch perform. He kind of looks like Erik Estrada, he does these cool ninja like moves. LARDIE: To me he looks like Erik Estrada and Al Pacino. We call him Raul Pacino. He’s got this energy and I think he really feels the blues aspect of what we’re doing. I know that with XYZ, that was always with him. He grew up with singers like I liked like Paul Rodgers and Ian Gillan of DEEP PURPLE, Rod Stewart, Glenn Hughes. He grew up idolizing the whole blues thing. When he did the XYZ records, I think they ended up being a lot more pop metal than he was feeling it. I think he really responded to the call when he started to sing with us, because his roots are in blues rock and I think it allows him to go back to who he truly is. I think as a result of that he is more energized by the music, by his performance with the music, which in turn gives him more energy on stage and inspires me to bring it. KNAC.COM: How long has he been in the band? LARDIE: He started to do the sub thing in 2011, and pretty much did the whole year because the other situation never returned to a healthy place at that point. We decided to go ahead and move forward in January 2012. We’re coming up on four years. KNAC.COM: How did you know he was the right fit? LARDIE: Everybody knew Terry as being the guy that could come in if something happened. He has subbed for other bands before. Everybody knew Terry from the XYZ days. In fact that was one of the last projects I ever worked at Total Access as the onsite staff engineer for the XYZ record back in 1987. So I’d see Terry everyday. That was way back then in late ‘86 or early ‘87, just before we started Once Bitten, so I’ve known Terry probably longer than anybody in this band. KNAC.COM: Is there any instrument that you cannot play? LARDIE: You know, real drums are hard. I can sort of bash my way around an electronic kit, and use drum samples, but it takes a lot of discipline and practice to play drums consistently really good. I think I just enjoy the challenge of, being able to say, “I think I’d like some mandolin on this song”, then instead of calling in a guy, to say, “I can learn this”. That’s part of the challenge of being a musician for me is to take in new influences and try new things and see if I can fit it into the GREAT WHITE umbrella. 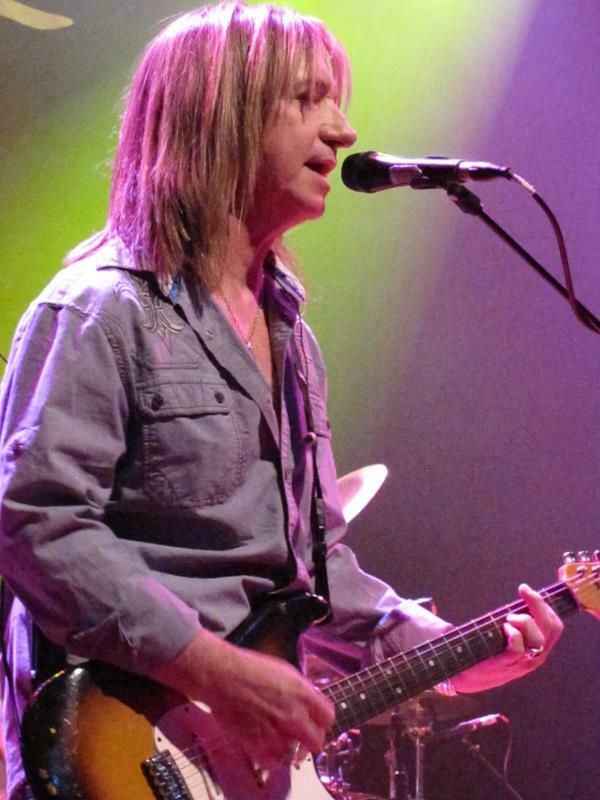 KNAC.COM: You’re also not the guy that shows up to a show with his guitar handed to you either. I’ve seen you working to set up your shows. Lots of knob twisting. You’re also very well rounded, being in the studio, doing production for other bands. I’m not sure if most people know that about you. You’re probably one of the busiest guys in the industry. LARDIE: Well, I guess I couldn’t decide what I wanted to be when I grew up, so since I’m still growing up, I’m still trying to figure it out. KNAC.COM: You guys released Elation in 2012? LARDIE: Yeah, we were lucky enough to work that record for almost 18-months and we had four singles in radio, which two of them did quite well. We’re working new material now. Whether it’s good or bad depending on one’s opinion, we are songwriters and part of our craft and what we do, so we continue to do it. Mark and I have always said that we never want to become a greatest hits band. Where we go out and play the same twelve songs from the same four records that happened 25 years ago and keep doing that for the next ten years. That is not emotionally, creatively or spiritually appealing to us. The idea of making new music whether it gets heard by ten-thousand people or a million, creating new music is one of the new motivators for doing what we do. KNAC.COM: Do you have any plans for your solo music? LARDIE: Yeah at some point. It’s just that thing where you go, “hmmm, is it ready to go yet? No, I think it needs a few more tweaks”. You know, I’ve been tweaking for the past three or four years. It’s finding the time to do it. I just don’t want people to think it’s going to be GREAT WHITE, the Sequel. I think if anything, it’s something that’s inside you that isn’t your normal thing. KNAC.COM: I’ve heard some of it and it certainly is not GREAT WHITE part deux. LARDIE: I think if anybody could put a label on what they’ve heard, they could say that it falls somewhere between Don Henley and Sheryl Crow. That’s just one aspect of who I am though. My musical tastes are so diverse. I don’t just listen to 80’s rock. I grew up on the BEATLES and the STONES, so it pretty much goes the gambit from left to right. KNAC.COM: You guys are touring this summer. But you guys are really never not touring, right? LARDIE: It’s interesting, since we parted ways with our management two years ago, we’ve now been basically managing ourselves. We pretty much told each other, “Is there any reason we can’t work in December, January, February and March? Um. No”. So we took the breaks off. It turns out we’re doing a fair amount of gigs that we would normally do, but I like to call it, working smarter, not harder. KNAC.COM:Yeah, we tend to want to do that as we get a little wiser through the years. I did not say older by the way. LARDIE: Well, as much as I hate to admit it, as we advance in age, not getting older (laughs), you want to do gigs that are of top shelf quality. We’re lucky enough this year to do some great things. We’ve got one coming up at the Hard Rock in Vegas that we’re actually going to film a DVD for. That’s going to be a great thing. We have two state fairs in Ohio and Kentucky. I mean real high class gigs, performances, crew. So when you go in to do those kinds of shows, there’s such a level of quality that you really feel a little bit like you did 25 years ago in the arenas. KNAC.COM: There’s a big tribute thing out now, at least in the area I live in, people love the tribute acts. It tends to be, as we advance in age, a little hard to put original music out for our peers, because a lot of people want to go out and wax on nostalgia and relive 25 years ago. Do you guys run into that problem putting out new music? LARDIE: Well, I don’t think we run into the problem much because we don’t and say, “Hey man, this is my new record. Dig it. We’re going to play it in it’s entirety and then at the end play "Rock Me" and "Twice Shy". We understand very clearly that our history and our legacy stands on the fact that we used to have popular songs from several records. If I was a fan of our band I went to see the band and they didn’t play things like "Lady Red Light" or "Save Your Love" or "Rock Me", I would be disappointed. At the same time, when we try to play new music into our set, we try to put in one or two at the time and as things go along try to rotate some things. That way, people can see what we’re up to, and if they like it, that they can go and find the record with the new material. We know there has to be some connection to our past. It’s the fans that bought those records that have afforded us to still have a career 30 years later.